The white shark is among the most iconic predators in the ocean. But for all their public exposure, the lives of white sharks remain shrouded in mystery. Their remarkable migrations and behaviors have come to light in the past decade, through the use of biologging tags. These sophisticated tags – think “wearables” for sharks – allow scientists to see beyond surface encounters or the brief interactions divers and fishermen have with white sharks. The tags allow researchers to follow the sharks as they journey, traveling thousands of miles into the open ocean, then returning each year to their coastal feeding grounds. Principal Investigator Dr. Barbara Block and her team at Stanford University’s Hopkins Marine Station have been using electronic tags to track shark migrations for years. 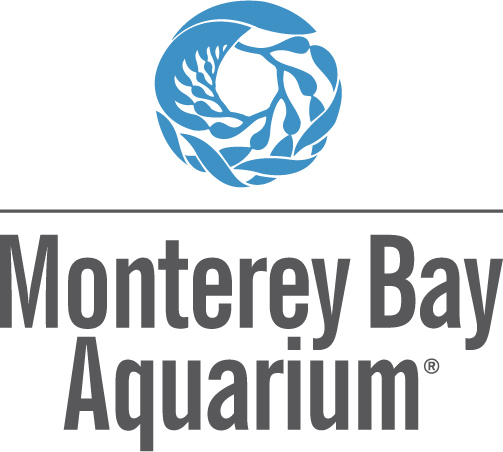 She and her colleagues from the Monterey Bay Aquarium have found that a large number of white sharks that forage each fall in the waters off California migrate annually to an open ocean region halfway between Hawaii and Baja. Fattened on a rich diet of seals and sea lions in the National Marine Sanctuaries along the central California coast, adult white sharks in winter and spring congregate in a patch of open ocean roughly the size of Colorado, known as the White Shark Café. Little is known about this remote sub-tropical environment and the behavior of sharks that convene there. Why would these large predators choose to leave the eastern Pacific’s coastal cornucopia for this remote oceanic desert? Café for Feeding or Mating? The tracking tags on white sharks have revealed unusual diving behaviors among the white sharks in their offshore home. The most notable change from the coastal forays to the deep sea is that the white sharks engage in “rapid oscillating diving patterns” or “bounce dives” when they reach the Café. These dives have V shapes: sharks dive at night to 100-200m depths and immediately return back up. In the daytime, these rapid diving movements include much deeper depths to 450 meters below the surface. Here the water can be quite cold and low in oxygen and the sharks only stay briefly. While the reasons for this unusual diving behavior are unclear, scientists have hypothesized that it could be related to the diversity and abundance of prey in this particular region. Or the dives potentially could be searching behavior – males seeking females in the clear, warm oceanic cafe waters. 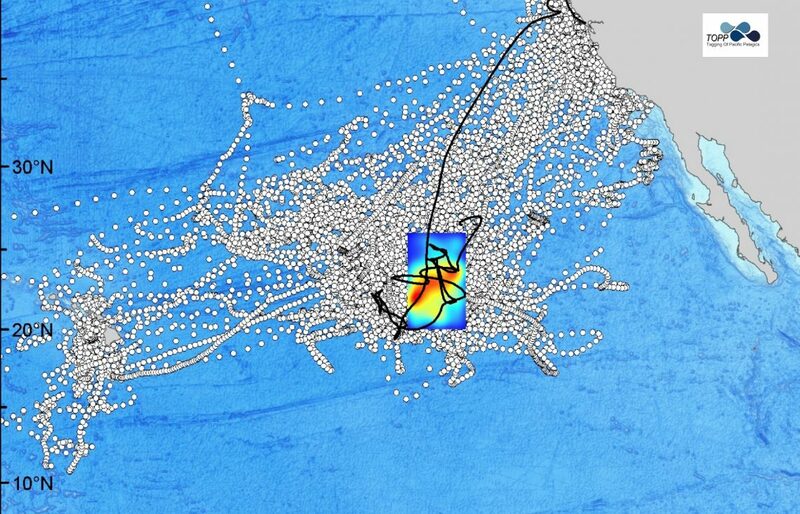 While satellite data of the surface waters of the White Shark Cafe show characteristics of an oligotrophic (food-scarce) habitat, little is known about life at greater depths. Very few research cruises in human history have explored this region of the North Pacific. The current understanding of the abundance and distribution of the communities of deep water animals is incomplete at best. 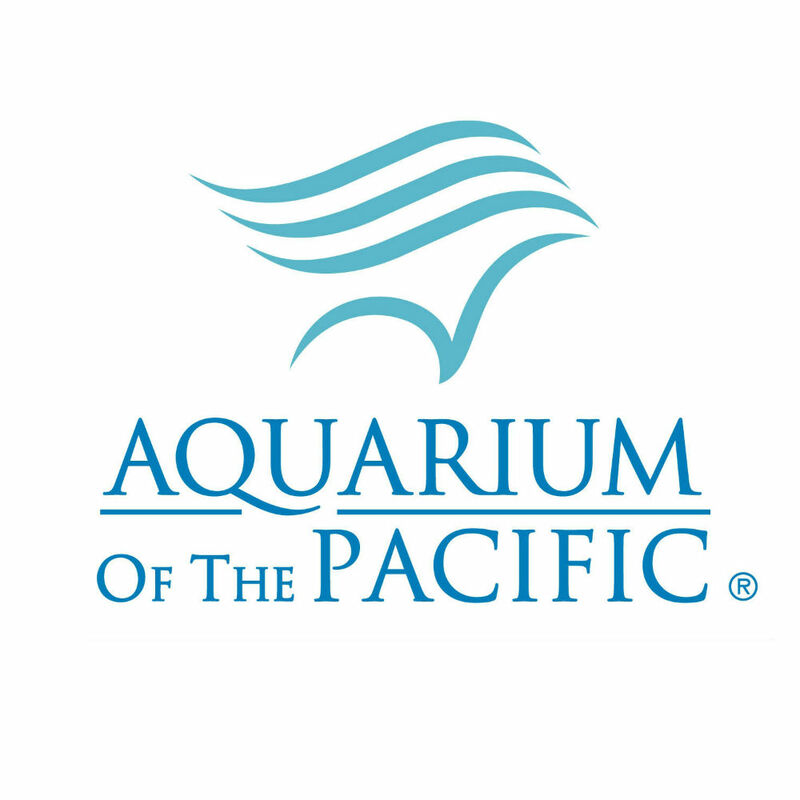 The Café occupies a very interesting region at the northeast edge of a large oceanographic structure called the “North Pacific Subtropical Gyre.” The sharks are swimming from the coast and entering the closest corner of the Gyre to North America. To the east lie waters influenced by the California Current, which carries cold, nutrient-rich water south along the US West Coast. To the south is a region of equatorial upwelling, which results in high ocean productivity. In the Café itself – think empty blue – we have almost no measurements of these biologically essential parameters. So the team simply does not have the measurements and observations to understand what that food source could be or why such a region would attract a large apex predator. In April, a multidisciplinary team of oceanographers, marine ecologists, and molecular biologists will sail to the Café aboard the R/V Falkor with the objective of locating satellite and acoustic tagged white sharks and studying their surrounding oceanographic environment. Building a complete understanding of the sharks’ biology and their role in these offshore, open-ocean ecosystems requires learning why this area seems to be vital to the shark’s ecology. The expedition will bring a broad range of tools to the task. Leading the way to the Café are 37 white sharks fitted with satellite tags by Dr. Block and her team during the fall months preceding the cruise when the sharks are close to shore. Two types of tags were put on the white sharks – satellite and acoustic tags. 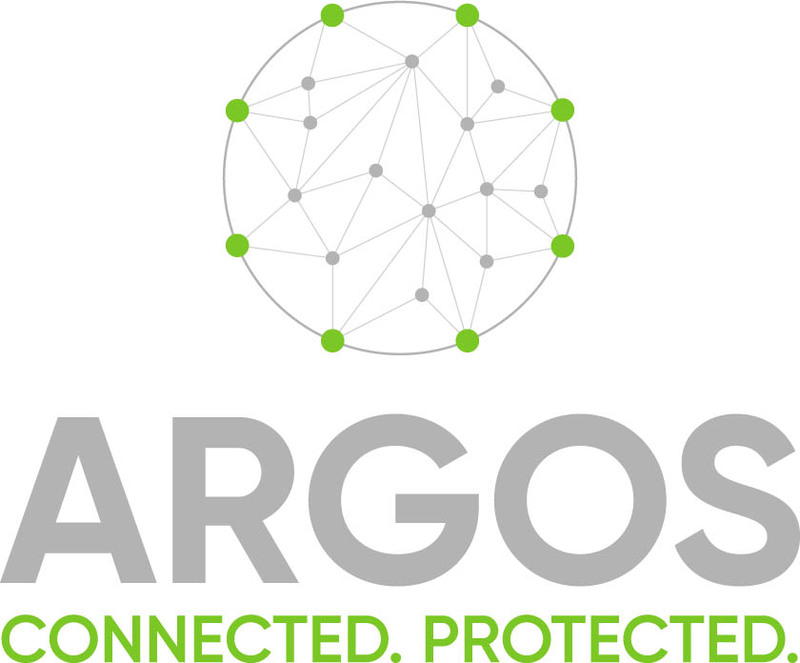 The satellite tags are programmed to release during the April-May expedition, and will provide the location of the sharks via radio uplinks to satellite while the Falkor is on location in the Café. 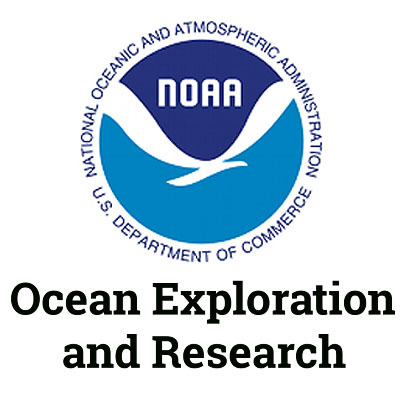 The scientific team will also be using some advanced research tools testing the concepts of how to conduct ocean observing in open ocean ecosystems. 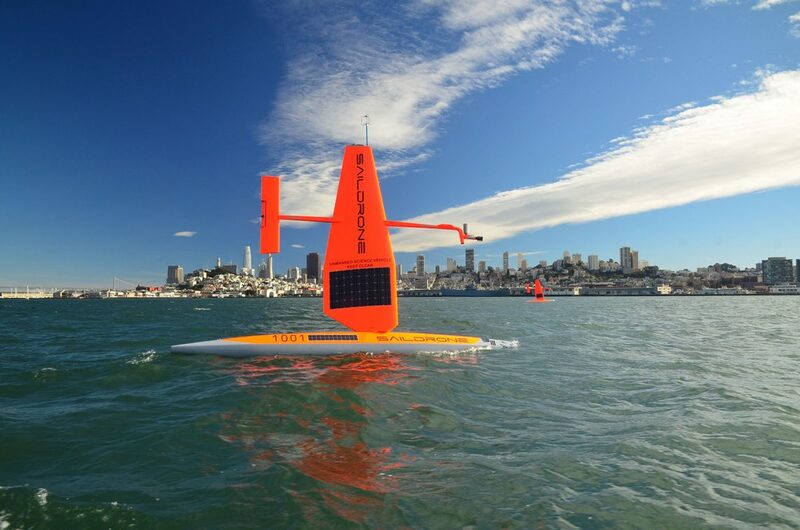 Two Saildrones, unmanned surface vehicles that “sail” on a fixed wing, are equipped with sophisticated acoustic instruments designed to locate plankton and midwater fish. 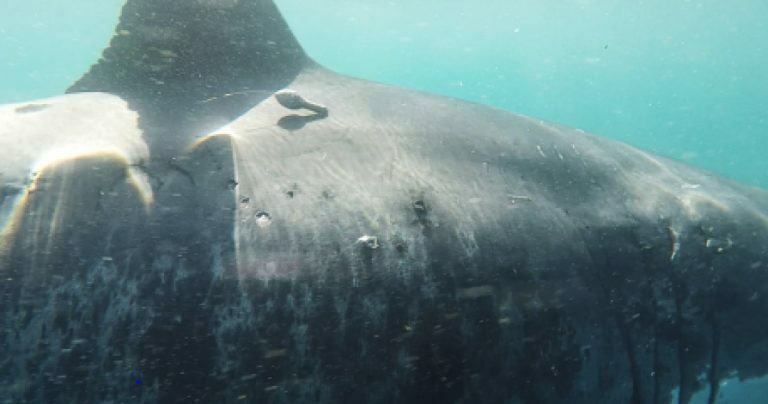 They are also equipped with a passive listening sonar capable of receiving a signal from any of the more than 80 white sharks with active acoustic tags that have been attached to sharks over the past four years. The team will also use an autonomous underwater vehicle called a Slocum Glider, which will be equipped with listening devices for the acoustic tags. These robotic platforms left in late March and will arrive at the Café in early April to survey the region prior to the ships arrival. The drones will signal to the team where the sharks are gathering and will help direct the deployments of the Falkor’s ROV and other ‘listening buoys’ equipped with camera systems. Conservation of large ecosystems in the high seas is not only critical to the protection of apex predators like white sharks, but for promoting overall environmental health across the globe. 40% of the ocean is open sea where natural resources abound and are the property of all nations. A 2016 UNESCO / IUCN report identified the White Shark Café as a potential World Heritage site, recognizing the unique importance of this region for white shark biology. 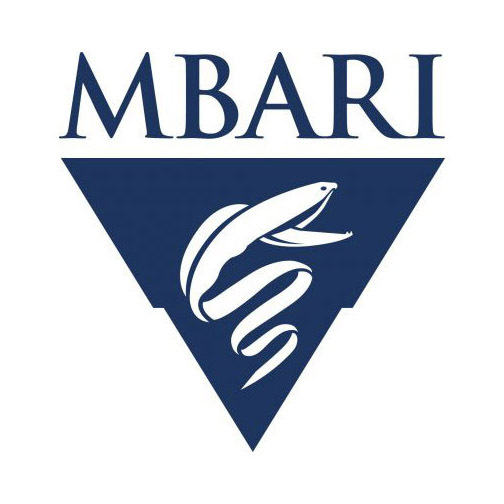 To achieve and sustain this protected classification, a great deal more information is needed about the site and the sharks’ behavior in the region. The information collected during this expedition will help to define the biological oceanography of the White Shark Cafe and to achieve the ultimate goal of protecting this essential ecosystem from overexploitation. A pop-up satellite tag on a shark. A saildrone leaves California, sailing towards the White Shark Café. WhiteSharkCafe.org – A resource with real time updates and data, as well as glimpses behind-the-scenes and shark profiles. CTD, EventLogger Documentation, and Navigation data from ROV SuBastian and Navigation data from Falkor are available at MGDS. 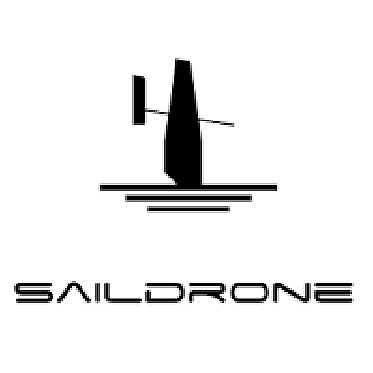 Data from Saildrone is available here and and here, via ERRDAP. This glider data is also available on MGDS. What’s the Shark Equivalent of Burning Man?